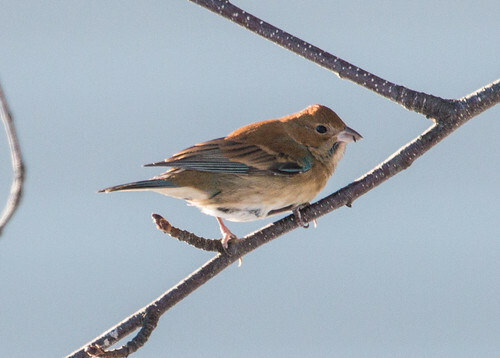 Laura's Birding Blog: January Indigo Bunting!? On January 2, I got an email from a neighbor who lives about a block from my house. 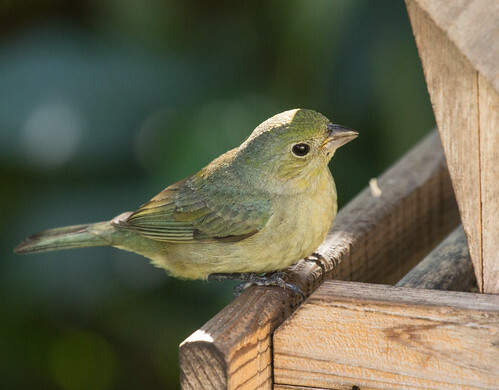 She said she had a tiny bird that she guessed was an Indigo Bunting at her feeders—a bird that had been visiting her for “a few weeks,” and that she may have seen last winter as well. She said it was skittish and came only sporadically for brief visits, but did come every day. I emailed her back asking her to call me the next time the bird showed up. An hour or so later, she called, and I rushed right over. Unfortunately, my walking down the street toward her house was enough to send the bird off, and it took about 2 ½ hours for it to reappear. Fortunately, we had fun talking in her kitchen as I stared out the window, and she makes good coffee to boot. When the bird finally reappeared, we didn’t want to scare it away again, so I took my first photos through the window; only after I got several that would at least superficially document it did I try for some out her opened front door. Notice the subtle streaking on the breast, consistent with Indigo Bunting, and the subtle malar stripe (the stripe along the jaw). These are consistent with Indigo Bunting. I got several from different angles, all from a distance. The door and camera sounds made it very skittish. I don’t usually talk about bird identification—it’s a tricky topic on the radio, and not all that interesting for me compared with bird behavior. But figuring out this out-of-place little bird has proven to be an interesting endeavor. The moment I saw it, I was certain it was a bunting. I withheld judgment about just which bunting at first, though. I thought it had rather strong wing bars for an Indigo Bunting, the only one normally found in northern Minnesota, at least spring and summer, which belongs in Mexico and Central America in winter. A few vagrants do appear here and there in the US in winter, but I had no field experience with them. I’ve seen Painted Buntings many times in Florida in January, but males are brilliant and unmistakable, and females are a unique greenish that is equally unmistakable. This bird was definitely not a Painted Bunting. Painted Bunting--nothing like my out-of-place bird! 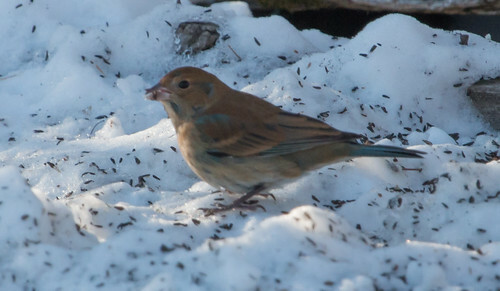 Of the birds I've most field experience with, this one's overall plumage pattern was most similar to female Blue Grosbeaks I photographed in spring and summer in 2013, except it lacked the chestnut patch on the bend of the wing. For a brief time I even thought the bill looked as close to a grosbeak as to the Lazuli Bunting, but that was just misplaced optimism because I don’t have Blue Grosbeak on my Minnesota list yet. Blue Grosbeak--notice the much thicker bill! This bird shows thicker wing bars than I expected, but they're not at all white. The warm color, "malar stripe" (along the jaw), and streaking are all consistent with Indigo Bunting and not consistent with Lazuli Bunting. Lazuli Buntings don't have breast streaking. I’ve seen very few Lazuli Buntings in my life—mostly in spring and summer in Arizona, California, and South Dakota, but also a vagrant in Duluth one spring a few decades ago. 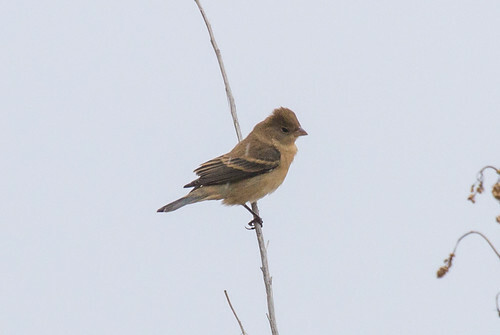 I’ve only seen one ever in winter—a female in basic or formative plumage at the Whitewater Draw Wildlife Management Area in Arizona in November 2013 during my Big Year. Considering how little experience I’ve had with the species, it’s ironic that one of my photos of that bird is featured in Nick Lethaby’s article about bunting ID. My November Arizona Lazuli Bunting--this photo was used in Nick Lethaby's article in Birding. But the bird in my photograph, a female, shows only the barest trace of blue, while the one in Duluth had much clearer blue highlights on the wings as well as the tail. And the better resources all showed that Indigo Buntings may have more pronounced wing bars than I’d realized, and several other points on this bird were consistent with Indigo rather than Lazuli Bunting. 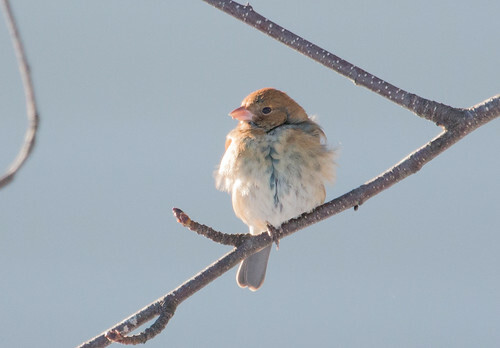 An Indigo Bunting does not belong in Minnesota in winter, obviously, but in the end, that’s what I, and several other top birders, agreed was the identification. I’ll try to get photos every few days as long as the bird remains, and my neighbor will keep me informed about when it last appears. This functionally illiterate bird never did read the field guides, so it’ll be fun to see how its plumage changes with feather wear over the coming weeks. Another birder got photos of the bird after my initial report, but hasn't shared them with me. Wow, that's a neat bird to have in Duluth in January! I'd say it's almost certainly an Indigo Bunting, with the only caveat being that it might be hard to rule out an Indigo X Lazuli hybrid. But the wingbars aren't outside the norm for Indigos in winter, and it has blue on the underparts where Lazuli wouldn't, so I don't think it's necessary to invoke the hybrid possibility. The only other point that someone might raise is that male Lazulis tend to show a lot more blue in winter than male Indigos. So the amount of blue in the plumage on this bird in midwinter might suggest Lazuli influence. But again, I don't think this is outside the normal range of variation for a male Indigo Bunting at this season. 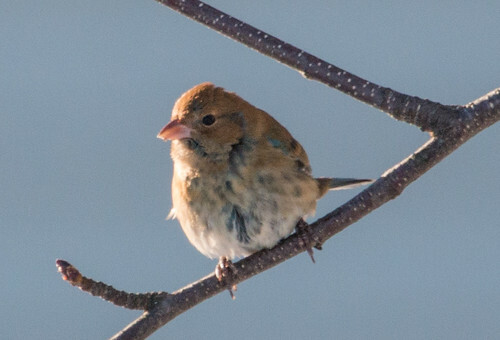 A bunting of any species in Duluth in January is an extraordinary rarity. 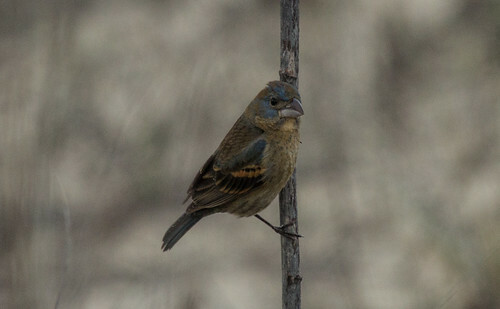 Although this one is rather at the extreme end of likelihood for an Indigo Bunting, a hybrid would be even less likely. Nick Lethaby wrote in that Birding article, "...the two species are known to hybridize, tempting observers to believe they are seeing hybrids rather than an unfamiliar plumage of a pure bird. I urge observers to understand the full range of variation that occurs within each species before considering the option of a hybrid." I'm not sure if the Minnesota Ornthologists' Union Records Committee will agree it's an Indigo Bunting or will decide to call it an "Indigo Bunting or possible Indigo x Lazuli Bunting." I'm using Occam's Razor: this bird is within the normal breeding range of Indigo Bunting, and although it has more blue than the average Indigo Bunting in winter, all its field marks are still within the normal range for an Indigo Bunting, so that's what I'm calling it. I'm not divulging the exact location of this bird, because my neighbor has good reasons to not want people milling around her yard. It's so skittish that people probably have as much likelihood of finding it somewhere nearby anyway.